"more" crafty? seriously adorable is enough, don't you think? i love them! LOVE these! Too much fun. We got all crafty today and it was a mess but a lot of fun. You'll have to let me know which shop you found the ones with the guitar - maybe they can make me some little party favor labels for Ry's party. Love that you get thme in a PDF format. Sweet! 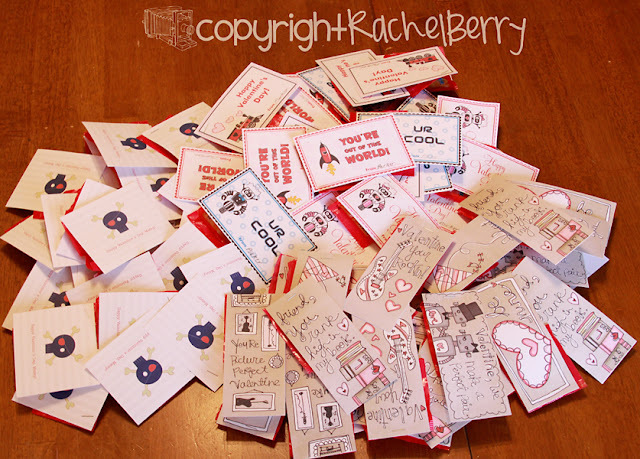 That's a lot of super cute Valentines. Adorable. Way cute! I love all of them! Are those top ones Elsie? Do give us your sources! Cute stuff! Those are so cute, Rachel!! And I hope you share some of those yummy recipes from your new book!! How CUTE!!! They look great. You can find great stuff on ETSY. Geez Rachel, you are stinking amazing. I'm going to have to hire you to do stuff like this for my kids (If/When I ever get to have some!) That and be a personal shopper for my little ones. Cause I love your taste! Those are really cute! I remember these days all too well. My kiddos are too old for Valentine's now. Everyone is welcome to follow my blog!!! fab idea!! i love them!! Those are super cute! I especially love the Jolly Rogers! FUN! Rachel love the valentines very cute:) I hope everyone is feeling better at your house. Those are so fun! I love that noone else will have them..makes it just THAT more special to give them! Sorry to read about your kiddos being sick..so are mine. They are doing a duet right now of hacking coughs. Sigh. We need a ginormous vaporizer for the house! What a great idea and those too cute. I just bought my kids at Dollar Tree, boring. Super cute & even better, ORIGINAL! I never would have thought to look on Etsy for Valentine cards, but it totally makes sense - you can find just about anything on that wonderland of a place. Hope your kids are feeling better. I know all too well what that's like. Those are very cute Valentines. I am off to my 2nd Valentine party this week..more to come tomorrow! That is a cool idea!!! I love them! 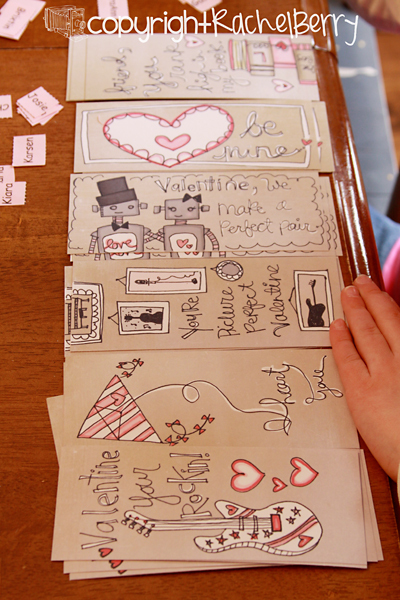 Those are way cute valentines! You guys do have a lot to do, phew! super cute idea! Wish I would have read this before buying them all at walmart with the rest of the countryside. Gotta love Middle School where they are too "cool" to do v-day cards. Only the elem. kids are doing them this year - woo, hoo. We only had 48 to do. Nah, nah, nah, nah, nah. Very cute! I did ours with my cricut and I was sorry! Mostly because the first set we went to complex the second set was simpler and I was happier! Next year store bought! Those are beyond cute. Why don't I live near you to benefit by your amazingness? rachel...what a great idea! I'll have to remember that! Hope that your kiddos have a fantastic valentine's day! I've given you a Kreativ Blog Award...stop by and "pick" it up anytime. adorable! I love the top ones! I hope all your kiddos are feeling better and you can get rid of that flu bug!!! Just what I thought. . .you're out to make me look like a la oozer. .but wow! 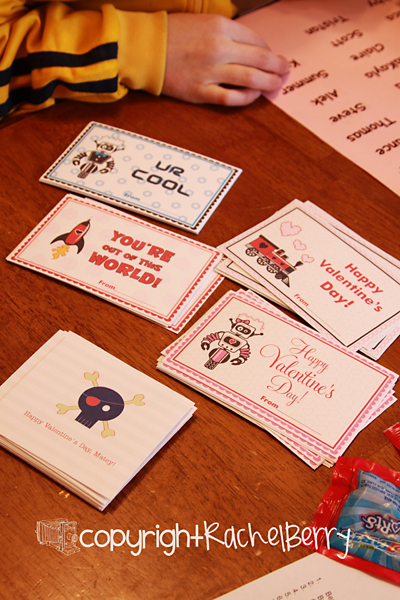 I went for super cheap & super generic premade valentines from Wally world. . .the boys said it with Spiderman, Batman & The Transformers. . .without more than meets the eye! You rock! Those are so cute! Easy is great! Well I never even thought of going to etsy for Valentines! Too late for me now but next year... watch out! Thanks for the tip. Very cute even if they used the word your wrong with the guitar one. Should be "you're" as in you are. My kids got valentine's from the local drug store. The end. Oh my gosh. I can´t imagine doing that many valentines. Oh wow!